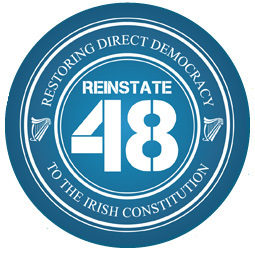 Reinstate 48’s sole objective is to restore to the people of Ireland the democratic rights given to them under Article 48 of the 1922 Constitution of the Irish Free State to make, mould, amend and repeal their own laws. The power of people to make their own laws is also known as “Direct Democracy”. It’s the democratic system that has been in place in Switzerland for over 150 years and it places the people as the supreme rulers of the state. To find out more about Reinstate 48, click here.